In case you haven’t noticed, gas prices continue to rise. Which means commuting costs are going up again for those who choose (or have no choice) to drive to work each day. Which of course, leads to Beltway congestion. And then the inevitable “who’s got the worst drivers” discussion, often yelled between cars with exclamatory sign language. Starting this fall, the Commuter Connections Work Program will begin paying people to carpool. That’s right. PAY YOU MONEY. Specifically, $2 a day. The pilot program is aiming to reduce the number of solo drivers on the region’s roadways by targeting three of the most congested stretches of asphalt. It’s not a new or innovative program – it’s been successfully done in Atlanta and LA – but it’s a great attempt at reducing traffic. 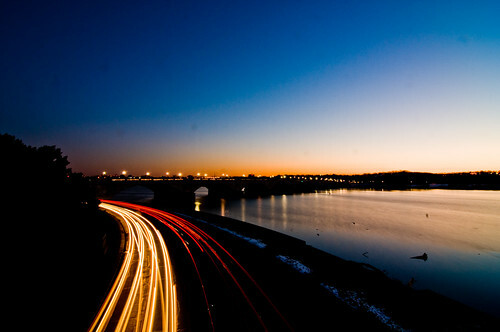 Similar programs from the past, such as the “Bridge Bucks” one that involved commuters on the Wilson Bridge, have been successful. I-395 North, from NoVA into DC. 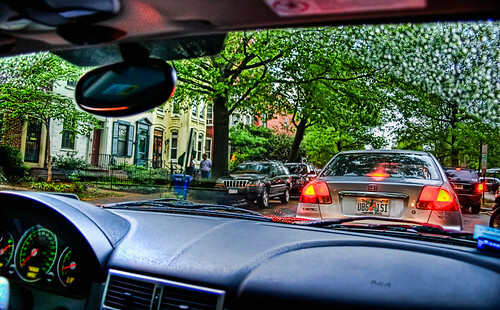 According to a recent study by the Transportation Planning Board, these three areas were identified as the most congested in the metro region. It’s estimated that as many as 8,190 vehicles per hour cover the stretch between Bethesda and Tysons alone. The program is estimating it can drop that by almost 250 cars an hour, if they can get the 700 first-time carpoolers they’re hoping for. The program is estimated to cost between $28,000 and $32,000 for each targeted area; funding will be coming from the federal Department of Transportation. If you happen to be one of the selected few when the program starts up, let us know how it goes!